Buffets And Boats Are Back! What's doing well in the current economy? Just about anything that's cheap. Case in point -- buffets! There's nothing more deeply American than a gluttonous all-you-can-eat buffet. And, I think all Americans need to rally around our traditions during this troubled time and just pig-out. Don't let the down economy keep you from that third or fourth belt-loosening trip to the buffet! Austin's got two new additions to the sushi landscape that are perfect for such feasting, and at everyday low, low prices. 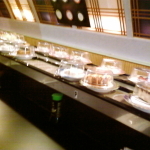 Just North of Austin in Georgetown, Texas is the Ichiban Sushi Buffet located at 1103 Rivery Blvd, suite 210. Go stuff yourself! Now, if you'd like some some novelty in your porcine pig-out, consider the newly renovated Korea Garden which now offers a conveyor belt buffet (called kaiten-zushi) that is common in Japan's low-cost sushi joints. Korea Garden, by the way, has changed it's name to "K.G. Sushi Train" (the "KG" stands for "Korea Garden," I suppose). The "train" is a conveyor belt, not a train. But what's important here are their prices which definitely ranks it as some of the most affordable sushi in Austin.